Provides easy access to charts while providing necessary privacy. 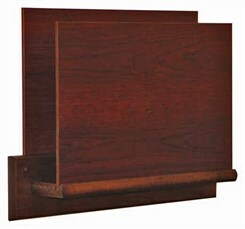 This HIPAA compliant rack has a taller 9" front panel to keep names and records private. Chart holder pocket is 13 1/2" wide and will hold files up to 2" thick. Constructed with 3/4" solid oak bottom and mounting plate. Wall rack is predrilled and include hardware for easy wall mounting. Measures 15-5/8"W x 3-1/2"D x 11-1/2"H overall. Shpg. wt. 7 lbs. PRICE INCLUDES FREIGHT! Please allow 1-2 weeks for delivery.